Great combination - Hearts & Jam but that has been the focus of my past couple of days. Besides working I have been busy trying to make the most of our apricot crop. 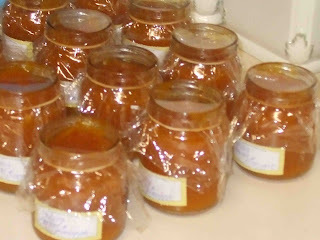 Tonight I made Apricot and Pineapple Jam. Here it is bottled. I have promised the girls at work a bottle as it is an old recipe apparently? So I hope it tastes as good as it smelt. 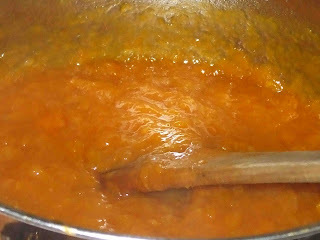 I am not a great fan of apricot jams but I will try some on toast in the morning before I take it to work. This swap is a lot of fun and I can't wait to pack everything up and send off to Shann. I hope you are all having a lovely week. The jars look so pretty, and it's so gratifying to make jams and things. Lovely. The jam sounds delish!! I have been eating some "nearly" seedless blackberry jam made by a friend on toast every morning. So good. EEEEEKKKK i peeked ! I admit it im a peeker, i cant help it. 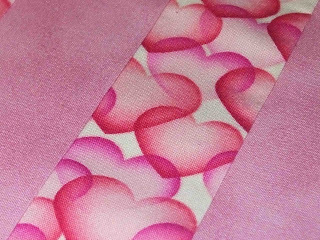 I saw pink, i saw hearts..im in love ! Oh and the jam...YUMMMMMMYYYYYY ! That looks yummy! Your little puppy in the post below is so cute. I have a Shihtzu/poodle. She likes to be the center of attention and is a very smart dog. It is glorious to see all your fruit and vegetable plants. We are covered in snow right now, so Spring here is only a dream. Thanks for following me! That jam looks great . Feels good not to waste doesn't it ? Especially when others love the jam . yum yum! I love making jam and have a huge bag of plums from my parents plum trees in my fridge to make plum jam tomorrow!!!! yours looks so pretty...do you save all your jars or buy them? Hi found your blog from a legacy of stitches.The jam looks delicious and you have been busy on the sewing also. Hi Fiona thankyou for visiting and following my blog , lovely to meet you . like you I am relatively new to blog land, and have just stumbled upon your blog - whilst I should be working I might add!!!! The jam looks oh so yummy, I cannot remember when I last did something like this.